Enjoy a guided tour of this imperial city. Gain local insight into city sites – each guide may put their own spin on the tour. Expect to visit the 18th-century Bab Mansour, the ornamental gate to the city, the bustling souk, the mausoleum of Moulay Ismail, and the Meknes Royal Palace. Listen to a certified local guide explain life in the Roman Empire at this UNESCO World Heritage site. Visit the impressive, well-preserved Roman ruins. Peer into old bathhouses, marvel at the still-present mosaic floors, and gaze up at towering marble pillars. Hear stories about life in this Roman city that will leave you in awe of just how far their empire stretched. Step back in time and embark on a walking tour of a UNESCO World Heritage Site - the Medina of Fes. Explore winding lanes and alleys to visit the many artisans, tanneries, and shops with an expert local guide. After, enjoy a G Adventures-supported traditional tagine lunch at a cooperative that benefits rural Moroccan women and children. This evening, opt to have dinner and entertainment at a historic riad. Follow a local guide through the Fès medina, one of the world’s largest medinas with more than 9000 winding streets lying within 365 hectares. See buildings in the medina that date back to the 9th century; there are 350 mosques in the medina that are still in use today. Enter through one of the great gates into the chaos. Explore the artisans’ quarters as well as the many carpenters, bakers, butchers, and spice sellers. A highlight is the view of the famous Fès tannery from the balcony of a leather shop, where you can observe the men hard at work treating and dyeing the different hides. Take some time to shop for leather goods before returning to your hotel. Enjoy a G Adventures-supported traditional lunch that benefits rural Moroccan women and children. This G Adventures lunch program provides access to education opportunities and healthcare services. The proceeds from this lunch program help support vocational training for rural women, allowing them to support their families and children. Enjoy a traditional home-cooked Moroccan meal and learn a bit of Arabic while you meet some of the women that are part of this program. Indulge in some traditional relaxation. Similar to a Turkish bath, visit the hammam to be washed, scrubbed and pampered. Part social gathering, part cultural ritual; don’t miss this cleansing experience. Completed in 1358, this educational institution is an impressive example of classic Moroccan decorative techniques. This educational institution was founded in 1325 deep in the Fés medina. Marvel at the Merenid artisanship found on nearly every surface of the courtyard. Housed in an exquisite 17th-century building, the gallery showcases different art styles passed through generations in Morocco, such as ceramics, embroidery, instruments, and costumes. Climb up to the rooftop for a panoramic view of the city. Explore the Sahara on a thrilling 4x4 dunes tour. Visit the village of Khamliya where you will meet Gnaoua musicians and learn about the history of their music in the Sahara before enjoying a performance. Depart back through the desert and visit local nomads to learn about nomadic life over cups of mint tea in one of their homes. Return to our Auberge then transfer to Tineghir for the evening. 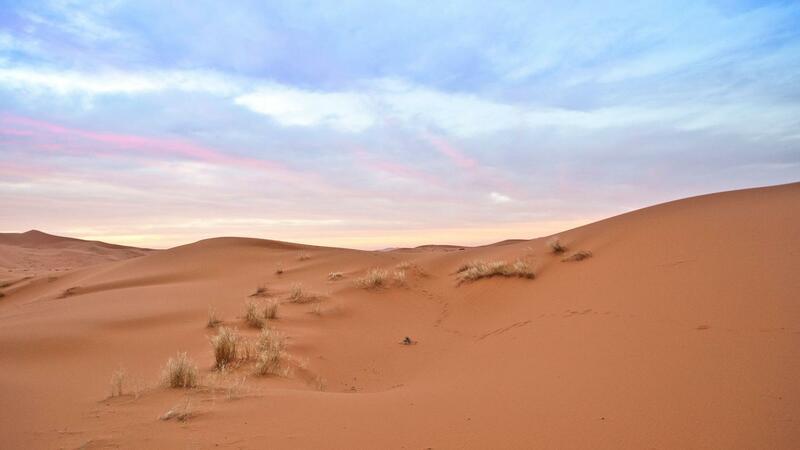 View the golden dunes of the Sahara desert on a 4x4 excursion. Watch the dunes as the colours creep across the landscape. Climb to the top of a dune and take in the view of the seemingly endless sea of sand. Continue on to the village of Khamliya where we meet Gnaoua musicians and learn about the history of Gnaoua music in the Sahara and enjoy a performance by these talented artists. Depart back through the desert region and visit local Berbers living in the area, learning about their way of life and sharing in some mint tea in one of the homes. Drive through the scenic Dades Valley and “Route of 1,000 Kasbahs”, passing by many of the mud-brick fortresses and abandoned villages. Stop at the Dades Gorge to admire the formations of the rock and the kasbahs built with their backs against the rock for protection. Visit the Taourirt Kasbah, a palace built in the 19th century for the relatives and servants of the ruling el Glaoui family. Originally, the Kasbah had hundreds of rooms and riads, but now the structure is partially destroyed. UNESCO has helped with the restoration of the Kasbah, allowing travellers to wander through the halls and rooms. It feels like you’ve stepped back in time. Learn about the traditional, natural remedies and cooking spices of the Berber people. Both herbalists and pharmacists swear by the healing properties of natural ingredients like ginger, argan oil, and mint leaves. Even ingredients usually found in a yummy tajine like saffron and cumin are used as pain relievers and to help with circulation. Tour the UNESCO World Heritage site and Kasbah of Aït Ben Haddou with your CEO. Of all the remaining Kasbahs in Morocco, the walls and interior of this area are the most intact. The Kasbah still houses a few families, but many now live in the adjacent village. Like many of the earthen built fortresses in Ouarzazate, Aït Ben Haddou has been used in many film and television productions like Gladiator, Babel, and Game of Thrones. With its unusual combination of cultures - Berber, French, Jewish, Andalucian – Morocco is known for some incredible flavours that visitors talk about (and miss) long after they return home. In the heart of bustling Marrakech, visit a historic riad for a hands-on cooking class led by a renowned Moroccan chef who will discuss key ingredients and techniques. From rolling traditional semolina to measuring out spices for a mind-blowing tagine, learn the culinary tricks of a master while preparing lunch as a group, which we’ll all sit down to eat (and marvel at). Spend free time relaxing at one of the tea houses around the square, indulging in the ubiquitous sweet mint tea, watching the hustle and bustle from your shady spot. 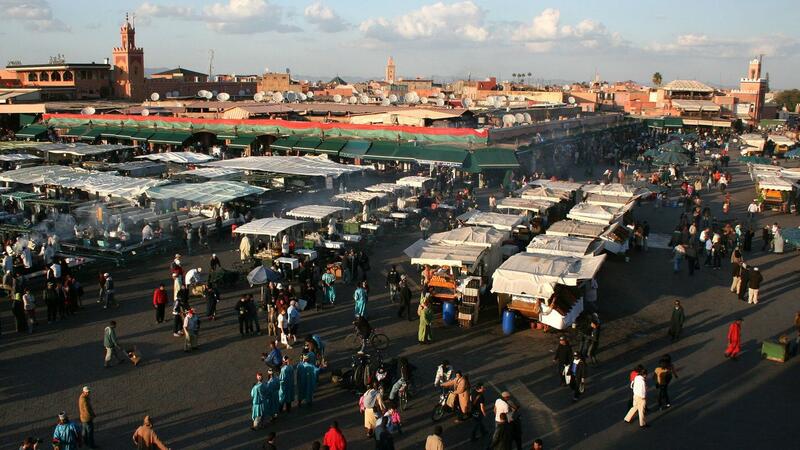 Or head to Djemaa el Fna Market for some lively entertainment. Wander past fresh orange juice stalls and water sellers in colourful costumes reminiscent of an era past. See storytellers, magicians, and peddlers of traditional medicines as the day progresses. When the sun sets, the square fills with dozens of food stalls, and is packed with locals, entertaining chefs, and waiters. Grab a spot on a bench with other diners and try the “tanjia” (slow cooked lamb), harira soup, grilled seafood, famous Moroccan couscous, tajine, snails, or even sheep’s head (for the truly adventurous). Wash it all down with some spiced tea. Visit this stunning garden in the heart of the city designed by French painter Jacques Majorelle (1886-1962). Follow the pathways through trees, exotic plants, streams, and pools while watching the numerous birds who call this peaceful paradise home. Be sure to also visit the Museum of Islamic Art located inside the gardens, featuring North African treasures such as textiles, jewellery, and carpets. Let a local guide show you the best of Marrekech. See the Koutoubia Minaret, Palais Bahia, Palais Badi, and Medresa Ben Youssef. Wander the bustling medina and take in the sights, aromas, and sounds of the brightly coloured souks. Experience a traditional 3-course dinner in the heart of the medina of Marrakech - Djemma El Fana square - and enjoy a folklore performance. Visit this Islamic college founded in the early 14th century, which is now a museum displaying the buildings ornate mosaics, marble tiling, stucco work, and woodcarving. Visit one of the lasting relics preserved after the destructive Almohad rule - a 12th-century shrine displaying the sophistication of earlier Almoravid architecture and design. Wander around the salons of the ornate Mnebhi Palace displaying various collections of Moroccan art forms. Visit the ruins of what was once the most ornate palace of the 16th-century. Its sunken gardens and pools give a glimpse into its former glory. Standing as a monument to master Moroccan artisans, this complex houses the Museum of Moroccan arts. Here, you will find displays of ancient weaponry, carpets, Berber jewellery, granary doors and more. Make sure to see the highlight of a visit to this museum, the painted, domed wedding-reception chamber. 8 breakfasts, 2 lunches, 2 dinners. National Geographic Journeys Exclusives: Sahara Dunes & Culture Excursion, Merzouga. 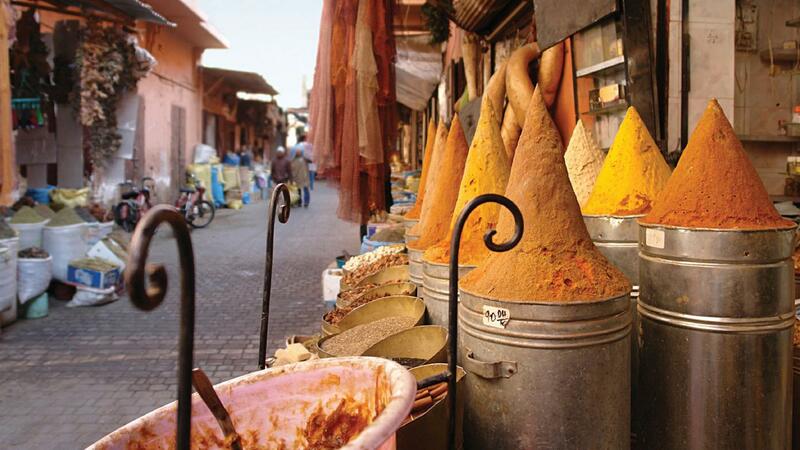 National Geographic Journeys Exclusives: Moroccan Foodie Experience, Marrakech. G Adventures for Good: Meknes Community Lunch, Meknès. Arrival transfer. Guided city tour of Meknes including the ancient granaries and stables of Moulay Ismail and Bab Mansour. 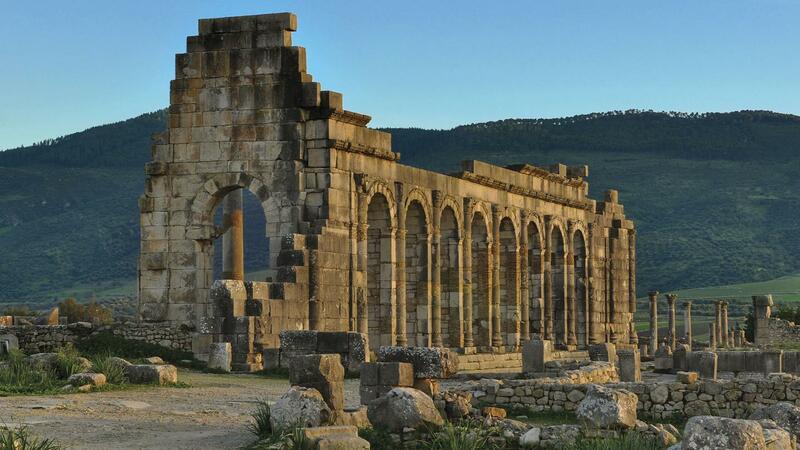 Guided visit to Volubilis. Guided walking tour of the Fes medina including Medersa Bou Inanya and tanneries. Visit Taourirt Kasbah and Aït Ben Haddou. All transport between destinations and to/from included activities. Where a town has both an ancient medina and a "ville nouvelle" we generally stay in the ville nouvelle, both because the standard of hotels is higher, and because travellers (especially women) often find the medinas at night a little confronting. If you will be taking the arrival transfer, please look for the driver holding a National Geographic Journeys sign. The driver will be waiting outside (they are not permitted to enter inside the airport) in front of the cafeteria Tokey's that is located in-between the exit doors of terminal 1 and terminal 2. Please approach them, and ask them who they are supposed to be picking up (do not tell them your name, they should have this information already). Once they give you the correct name, have your passport ready to show them and you will be on your way! If you'd like to book a departure transfer from Marrakech Hotel to Casablanca International Airport, please choose an 8am shuttle option for flights departing after 14:30, and a 13:30 shuttle option for flights departing after 19:30. To give you sufficient time to catch your plane, please do not book a flight home which departs before 13:00 at the absolute earliest. Please note this information is given in good faith, is beyond National Geographic Journeys's control and subject to change at any time. Generally, all meals are not included in the trip price when there is a choice of eating options, to give you the maximum flexibility in deciding where, what and with whom to eat. It also gives you more budgeting flexibility, though generally food is cheap. Our groups tend to eat together to enable you to taste a larger variety of dishes and enjoy each other's company. There is no obligation to do this though. Your CEO will be able to suggest favourite restaurants during your trip. The above information applies to G Adventures group trips. For Independent trips please check the itinerary for details of meals included. For all trips please refer to the meals included and budget information for included meals and meal budgets. All breakfasts are included as part of your tour. Moroccan breakfasts tend to be different from your usual cereal and toast morning fare – most will be very simple - a croissant or sweet roll with jam and instant coffee and some hotels will have buffets where you will have more variety. While you are experiencing what a Moroccan family would eat, some travellers do find the provided breakfasts a bit “bread heavy” and enjoy buying fruit the day before to supplement their breakfast.